Cell catabolise proteins by two pathways, lysosome and proteasome. Proteasome is an ATP dependent pathway that plays a critical role in growth and development of the cell by degrading regulator of cell cycle. Proteasome degrade misfolded or unfolded proteins. It also breaks down peptides from infecting organisms for antigen presentation as a part of immune response. As the system is essential for life and is involved in a wide variety of critical processes, it was believed that proteasome was not a therapeutic target. However the first proteasome inhibitor, bortezomib, has shown t be a very effective therapy for myeloma patients. 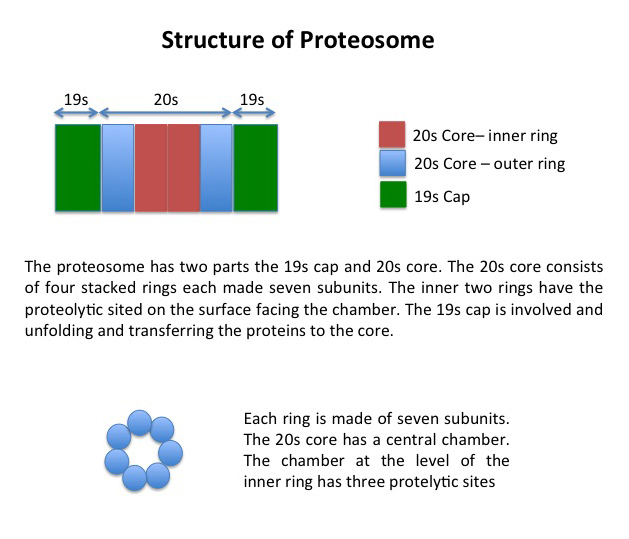 Proteasome has two components, the 19s cap and the 20s core. 1. 19s cap: The 19s cap has 16-18 sub-units out of which 6 have ATPase activity. The 19s cap needs energy to unfold proteins and transfer them to the core. 2. 20s core: The 20s core consists of four stacked rings two inner and two outer that enclose a chamber. Each ring is made up of seven subunits. The inner rings are made of β-units and have three proteolytic sites per ring facing into the chamber. The outer rings are made of α subunits and control the aperture of the chamber. The aperture is large enough to allow only one peptide. Multiple molecules of ubiquitin are added to proteins marked for destruction. Ubiquitin is a highly conserved 76-aminoacis peptide. It has a terminal glycine thru which it attaches to other peptides and a lysine at position 48 to which another molecule of ubiquitin can attach via the second ubiquitin’s terminal glycine. The cap 19s unit of proteasome recognizes peptides that have at least 4 ubiquitins, deubiquitinated and unfolds such molecules passed them on to the core. Proteolysis takes place as the peptide is passing through the core producing smaller peptides that exit from the other end. These peptides are converted to amino acids by peptidases. Ubiqutination of proteins takes place in three steps. 1. Activation of ubiquitin activating enzyme (E1) by addition of ubiquitin in an energy dependent reaction. 3. The ubiquitin ligases (E3) transfer the ubiquitin from E2 forming a bond between the terminal glycine of ubiquitin to the NH2 group of lysine on the protein to be targeted for destruction. 4. The above steps are repeated an multiple molecules of ubiquitin are added to the first ubiquitin by formation of an isopeptide bond between the terminal glycine of the ubiquitin to be added and the lysine at position 48 on the ubiquitin molecule that is attached to the peptide. The protein specificity of the ubiquitination is a result of specificity of E3 ligases for proteins. There are almost 600 ligases likely to be present. Each of these ubiquitinate a different protein(s). Protein destruction is controlled by controlling the E3 ligase. Proteasome in view of it widespread distribution and participation in many reactions critical for cell survival was not though to be a good therapeutic target. The first proteasome inhibitor in clinical practice, bortezomib, has radically changed the outlook of multiple myeloma. It is also is used in mantle cell lymphoma.